Leah Krier has struck again with a brazen grand larceny of ransacking Spencer Young's belongings at a UHaul Storage facility in Durham, NC. In this criminal act, she continues to spiral out of control and is effectively proclaiming: "I'm above the law, and I can steal whatever I wish from my former fiancee', whom I abandoned when he needed me most. And I am doing this with reckless abandon because wonderfully crooked officials representing the law are not only helping me, but providing me very specific guidance -- in fact, I'm so giddy about this, I feel like a kid in a candy shop!" Leah, are you really so utterly clueless to think all these high-powered officials are helping you commit felonies, covering for you, and looking the other way because they think you're special? Let me explain: They are encouraging you to do things that will get me so angry at you that I will do something stupid in the heat of emotion, for this is ALL part of the desperate efforts to cover-up MorganStanleyGate. I will NOT lash out at you, and I expect to forgive you for ALL of your horrible acts since we were victimized in the worst bank foreclosure fraud in US History . . . but I will NOT be able to do so until you WAKE UP and express contrition for your reprehensible behavior. In the meantime, I will prosecute you criminally, and in the event you are unable to turn away from "the dark side", the charges will NOT be withdrawn. 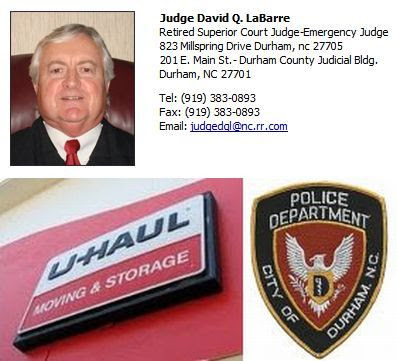 Corrupt others who made this possible include: (1) retired Superior Court Judge David LaBarre, who was specifically brought out of retirement on an "emergency basis" to facilitate this fraud; (2) the Durham Police; and (3) UHaul employees. And for these people, this was an encore performance to the grand larceny earlier this year. Of note is Judge LaBarre's patently unethical and unlawful behavior -- He continues to issue the bogus open-ended court orders without Spencer Young's knowledge, without proper service and without due process of law to allow Mr. Young the opportunity to prove he OWNS the valuables Leah is now stealing. Fundamentally, he shouldn't have to do this, because Leah Krier has the burden of proving she owns what she has been stealing from leasehold storage units owned by Spencer Young . . . yet this corrupt Judge is complicit in this grand larceny. Have we now entered "Bizarro World"? Here is a reality-check news flash for ALL involved -- You CAN'T do this in America . . . it is against the law, and you WILL be held accountable. For if this behavior was condoned, anarchy would break out, looting would be the norm and the concept of property ownership would simply not exist. The below email further explains what occurred and specifies follow-up items for UHaul to make good on. You Failed To Notify Me of Attempted Access – I asked you to immediately advise me if ANYONE attempted to access to my storage unit at your facility. You Failed To Do So. You Failed to Advise and Present Me With Any “Court Order” – I asked you to immediately advise me if you were presented with a court order and fax it to me. You Failed To Do So. You Ignored My Instructions – I called you in the afternoon on August 18th and advised Leah Krier would likely be coming by to access the unit. I instructed you to not allow her access, and to advise me immediately. I was then put on hold and no one ever picked up. Subsequent calls were then diverted to your call the UHaul National Call Center. As I now understand, Leah had just arrived at the facility and was ransacking my unit (with your assistance) when I called. Status of My Storage Unit & Its Contents – Please also address: what happened to my lock? ; What’s the status of security at my storage unit? What is the condition and extent of its contents, at this point? Please take a picture of its contents and also email it to me. I would also like to understand why Paul Smedberg (your supervisor) has failed to cooperate in providing the long requested security tapes of Leah Krier’s grand larceny in April, and why he never returns my calls. This is the United States of America, and UHaul’s behavior would suggest this is a backward third world country. Suffice it to say, if this were standard operating procedure for UHaul in the treatment of its customers, it would no longer exist. Be advised continued lack of cooperation will implicate UHaul and its parent company (Amerco) in the aiding and abetting of a felony. I didn’t start this fight, but I sure as hell am going to finish it . . . which means I’m going to be all over this like white on rice. And when you respond back in writing (with copies to the Durham Police and Charlotte FBI), please confirm, under penalty of perjury, that you are not related in any way to Leah’s best friend, Leslie Crabtree of Durham, or do not otherwise know her. Note that law enforcement and the news media are being provided this transmittal due to its association withMorganStanleyGate, which will become obvious in the coming weeks. I have also separately circulated this to Leah Krier’s family, friends and her employer . . . because her behavior is now completely out of control, which greatly saddens me. I have spoke to no one about any of this in months. Especially not earlier that day. She showed up maybe a week or so prio and I told her she was not allowed in anymore because of all of the confusion and she simply left and came back several days later with more papers. And I am sure you will say they are fake too but like I said months back that is not my wrong doing if they happen to be. Everything looks legit.